North-West e-learning mentor projects : "Advanced wikispaces skills" session challenges presenters! "Advanced wikispaces skills" session challenges presenters! Jill and michael ran a session on the advanced aspects of wikispaces. Clearly nobody feels "advanced", because we were alone in the session. However, we thought that some skills were worth demonstrating anyway. So we went ahead, intending to record the presentation for possible future value, and also to share some tips & strategies with each other. The large menu was designed to give people a choice (too much for one session) ..so we decided to focus on only 3 of the skills. Okay the hilarious thing for us was that whatever we tried to demonstrated (for the recording), had changed since we last worked it out. Great. Thank heavens nobody came. Personally i think it can be good to show people that you don't know everything, that the expert is not a guru, and that feeling foolish in front of your peers is a perfectly acceptable part of the modern educational narrative. It really illustrated the fact that you just can't ever rely on software remaining the same. You always have to adapt. The people who will succeed in integrating technology into their working lives most successfully, are the people who can work in a problem-solving way as they adapt to change. So. We may share the recording, or we may hunt out some resources to go with this post. Stay posted. What about you - how do you feel when you demonstrate technology in front of your students, and everything has changed? What strategies do you use to cope wit the situation? Well, the benefit of this experience was that I learnt some extra skills/ features (I wish I had chosen to demonstrate these instead!). Maybe I'll discuss these in a later post or add them to yours, Michael. Hi Jill and Michael - I was really disappointed I couldnt join your session at the last minute. Seems like it would have been a bit top-heavy with wiki gurus if I had lol! It looks like it was really well-planned and the tips you gave (to your imaginery audience) were ones that are really useful. On the topic of software changing on you - That happens with me and wikispaces quite often. They continually change things. The worst time was when I was giving a face-to-face intro to wikis class to a new group of very tech-nervous students and not only had they changed the sign-on procedure in wikispaces private label but added to that two keys got stuck on my laptop and wouldnt even type in the commands properly! 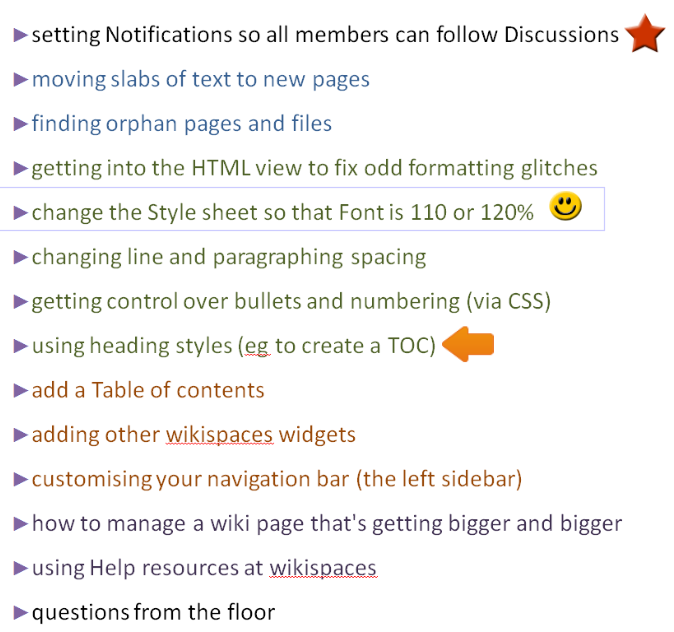 I explained that the reason they were unable to get into the wiki was because wikispaces had changed the sign-on procedure and I was having to relearn it on the run! We eventually all managed to sign on and I reassured everyone that now they were all signed on the rest would be much easier - and it was! 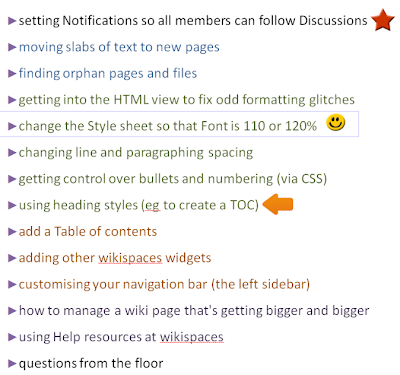 I have resolved to always use the bulk signup to wikispaces in future just in case it happen again! There have been countless other times with wikispaces so I know how you feel Michael and Jill! OK - I've taken the opportunity to produce a screencast on how to set your Notifications and how to reply to a Discussion post - to redeem the all-together disgraceful situation of being a victim of techno-change!